Russia's Ministry of Defence has posted what it called "irrefutable proof" of the US aiding so-called Islamic State - but one of the images was actually taken from a video game. The ministry claimed the image showed an IS convoy leaving a Syrian town last week aided by US forces. 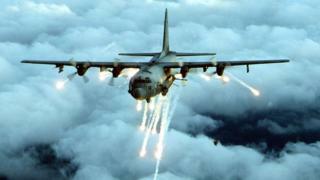 Instead, it came from the smartphone game AC-130 Gunship Simulator: Special Ops Squadron. The ministry said an employee had mistakenly attached the photo. The Conflict Intelligence Team fact-checking group said the other four provided were also errors, taken from a June 2016 video which showed the Iraqi Air Force attacking IS in Iraq. The video game image seems to be taken from a promotional video on the game's website and YouTube channel, closely cropped to omit the game controls and on-screen information. In the corner of the image, however, a few letters of the developer's disclaimer can still be seen: "Development footage. This is a work in progress. All content subject to change." Hours later, the ministry published an updated statement with a different set of images, which it also said proved their claims. It repeated the claim it was "irrefutable evidence that US are actually covering Isis [IS] combat units to recover their combat capabilities, redeploy, and use them to promote the American interests in the Middle East". Russia alleges the US is co-operating with so-called Islamic State by providing cover to fleeing IS militants. In a Facebook post, the ministry said it liberated the town of Abu Kamal last week alongside the Syrian army. It said the US-led coalition refused requests to cooperate and "eliminate fleeing Isis convoys". It also accused the US-led coalition of carrying out air operations in the area to interfere with possible Russian strikes, and alleged that IS forces were disguising themselves as US-backed SDF fighters. "The US are actually covering the Isis combat units to recover their combat capabilities, redeploy, and use them to promote the American interests in the Middle East," the statement concluded. A later press release said it had launched a probe into the actions of a civilian employee of one of its subdivisions who "mistakenly attached photos" to the first version of its statement. Responding to Russia's allegations in remarks carried by Reuters, a spokesman for the US-led coalition Col Ryan Dillon said the Russian allegations were "about as accurate as their air campaign". "I certainly can't verify, but I've seen the report that one of the pictures came from a video game. So, again that is pretty consistent with what we have seen come out of Russian MoD, as being baseless, inaccurate and you know, completely false," he said.